The ability to make location based offers via a mobile device enables sales and marketing personnel to go the extra mile in offer personalization. By taking into account the customer´s proximity to our products, his preferences, demographic characterization, the context of the interaction and branch location, we can provide highly effective offers. RTOM provides an out-of-the box solution for location based offers while providing the advantages of learning capabilities and easy offer business rules configuration. As mobile devices become the preferred channel of interaction for many people, marketers and advertisers are looking for new ways to leverage this medium as a direct communication channel with their customers. One of the most personal and direct marketing strategies is to provide offers based on the customer´s current location. When a customer is within the proximity of our products or branch location, a personalized and relevant offer can lead to immediate response and acceptance of the offer. The following scenario assumes that a coffeeshop chain is seeking to reach customers who decreased their purchases in the previous month. If such customer is within the proximity of a branch, he will be offered a free scone for every coffee cup purchase. The offer will be defined in the standard RTOM UI as illustrated below. The eligibility rule for this offer will target the customer group who spent less than their usual average in the previous month. It is also possible to take the customer preferences into account when detecting offers on this screen (Vegetarian, etc.). Specific targeting can be defined by using the recipient profile criteria. At this stage, we will only define basic targeting criteria based on the customer´s age. A fully detailed illustration of RTOM offer creation can be found on the previous post of this blog. The locations at which the offer will be detected can be added to the offer, RTOM will link those triggering locations to the offer. When the customer is within the proximity of one of the locations, RTOM will evaluate the targeting rules and learning experience to send the customer highly targeted and personalized offers. In our example, a customer who matches the targeting profile is within 500 meters of our branch. RTOM will look for the most relevant offers according to the business goals. In this case, it will make the offer “Buy a coffee get a free scone” while showing the nearest branch location at which this offer can be used. 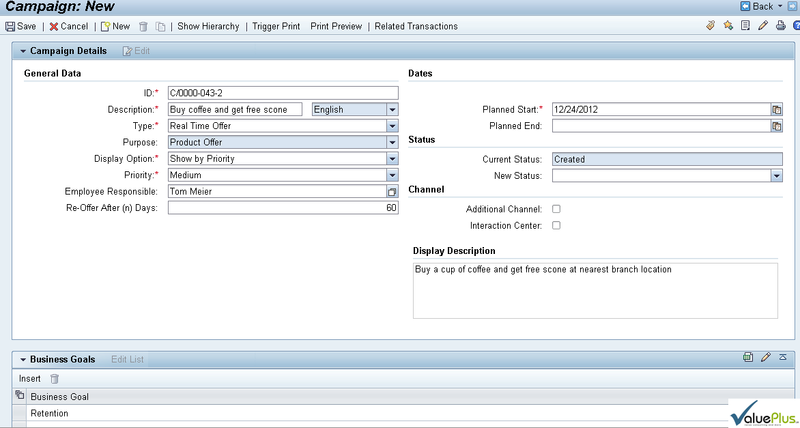 SAP Apollo project for precision retail is another example for RTOM location based advertising capabilities. Using RTOM learning experience and location based offering enables to reach customers in a more targeted and effective way. More information can be found at Value Plus website.